Pagodas from ancient Japan were built purely from wood. Japanese cypress wood is the only material used, there were no nails and no concrete reinforcements. Yet these pagodas are incredibly strong and are sturdy enough to have survived not only time, but also natural disasters such as earthquakes and typhoons. These amazing towers have religious history and have actually drawn influence from India. They could be found all over, including on ships. The pagodas could rise very high, with the tallest having reached 108 meters tall. The construction, as seen in the section at the bottom, is a considerably impressive piece of design and engineering. Everything was built around a central pillar, but this pillar was not load bearing and does not support any of the tiers. 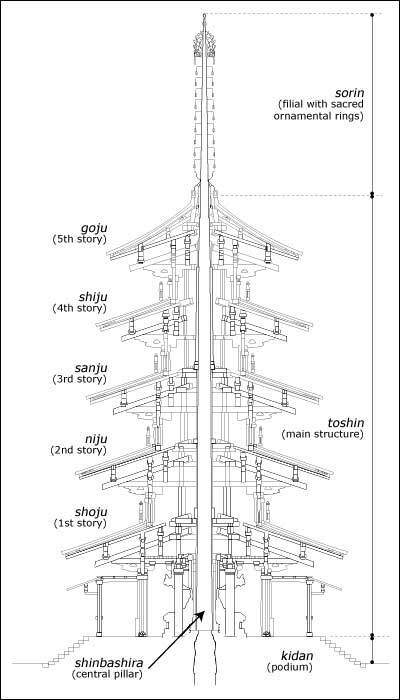 In fact the five tiers of the pagodas work individually of one another in regards to structure. This allows the pagodas to be very flexible and as such survive disasters like earthquakes by simply wobbling. I think that this approach to structure is very worth bearing in mind for my own designs. Furthermore, I am very much a fan of the aesthetics of the pagodas, as well as the way in which they work with surrounding nature. They do not oppose natural surroundings, they sit in comfort amongst them. The Nottingham Arboretum is a park, full of nature, and so in my opinion, a design which works with this is in the best interests of both the park and the clients it is intended for. Having chosen to try and encourage interaction with nature and views all around, I believe that making the design feel natural would be ideal. Timber construction is already a good start to this, but the material can only do so much, the design decisions themselves also carries important weight.